This is the first in a series of guest blog posts by writers I admire. 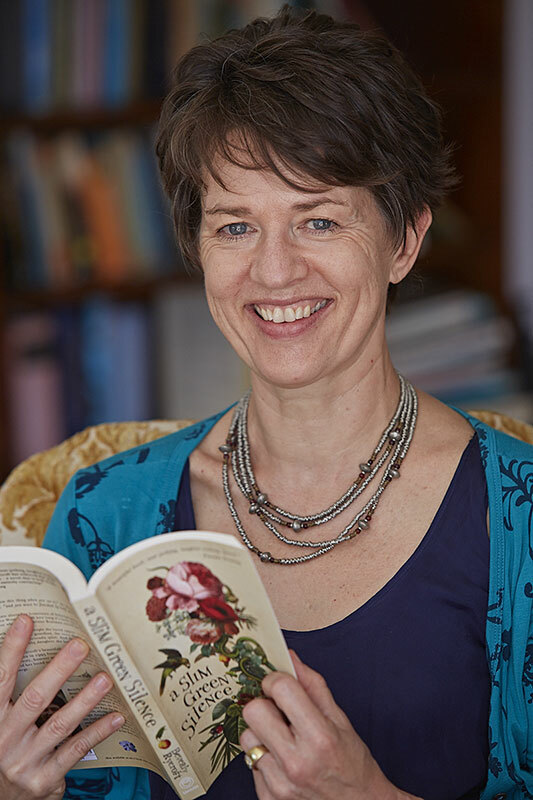 Having enjoyed speaking and reading with her at The Aldeburgh Poetry Festival last year, I am especially pleased to have Beverly Rycroft as my first guest blogger. Full details of Beverly’s recent work can be found at the end of this blog post. The rush of heimwee (Afrikaans: homesickness/nostalgia) that I felt on reading Derek Walcott’s Midsummer, Tobago was triggered not only by missing my family in South Africa, from longing to be a daughter protected by parents again. The first stanza of the poem, describing the “white heat” and “scorched yellow palms” of Tobago, also transported me to summers on the Transkei coast (even though there are no palm-trees there). So despite the differing locales of London, Tobago and South Africa, there was a universality to that poem that scooped up and named what had been gnawing away at me. Somebody else had felt what I was feeling. I was part of the human race. In a year’s time I’d be home again. In a decade I’d have my own daughters, who, in another two decades would leave home to live and work in London themselves. Yet this poem remains a thread that knits together the yearning I felt for home and family as a daughter, and, now, the same longing as a mother. For me, the power of poetry is also the insight – often like a lightning-strike – that the undisciplined emotions I’m feeling are neither new nor strange. My favourite poems feel like a letter from the poet written just for me, where my confused (and happy – but that’s for another day) emotions are expressed in a “blowing the top of my head off ” way. A way that makes, as the adage goes, the familiar strange, and the strange familiar. In the last fifteen years, many of these emotions have come from wrestling with my mortality. Without exception, the life-saving poems on Anthony’s blog (and now book) present me with a sense of stopping in the stream of life to consider, a reassurance that we are all one, in life as in death. Beginning with the title, Amaze proceeds to unwind the astonishment and wonder of being human, by gazing at the writer’s hands. The continuity of life (even after we ourselves have gone) is reflected in the enjambment of the single-sentence poem. (Crapsey invented the cinquain – a 5 line verse with varying syllables). There is a beautifully-calibrated balance which sees “I know/Not ’’ being weighted by “I think”, and “Not these” being ballasted by “Like these’’. In the light of the uncertainty of the first four lines, I love the weight of the final two words before the final, and only, full stop. What draws me to this poem is the accurate and fresh way Crapsey portrays how we can be distanced from our own bodies. People undergoing extensive surgery or treatment for illness will relate to this. The poet is about to flounder in this split between body and mind (“I know/Not”). But she steadies herself by a thought: she is a link in a long line. I find it soothing to know that death is nothing unusual, and that even after I, too have died, life will go on. Perhaps it’s that oneness, that being part of humanity again that reassures me. It doesn’t matter that Ted Hughes’ Full Moon and little Frieda was written many years after Crapsey’s poem. The final lines: The moon has stepped back like an artist gazing amazed at a work/ That points back at him amazed is another paean to the wonder of our existence. And an enchanting example of the conversations between poets across centuries and continents. Those conversations continue. In our loneliest times, poetry brings a voice that says: you are not alone. This is what it means to be human. It brings solidarity. And, best of all, hope. If I had a time-capsule to send into space, I’d seal these lines up for eternity. BEVERLY RYCROFT’s debut poetry collection, missing, won the 2012 Ingrid Jonker award for a South African debut poetry collection. missing (Modjaji Books) is the story of severe illness, recovery and hope. She has also won the Thomas Pringle prize for poetry in journals, and came second in the Sol Plaatje/European Union poetry competition. Beverly has performed readings of her work at literary festivals across South Africa and at Aldeburgh poetry festival in the UK. She is currently working on her second collection. Her first novel, A Slim, Green Silence was published by Umuzi in 2015. You can buy all of Beverly’s books here. Her first novel, A Slim, Green Silence was published by Umuzi in 2015.
wonderful… thank you for sharing. poems can put into few words what we are feeling about a particularly phase or with life in general? My pleasure, thank you for saying so! I already know this post will stay with me for a long, long time. Thank you! Bless you for saying so! I think poetry is wonderful, keep writing. Poems truly are power. They are a conveyer of feelings in print. love poetry! Poetry to me is the window to our souls! Nice post! Bless you for saying so. How does one become a guest blogger or get a guest blogger on their site? Thanks for your comment. In the case of Bev Rycroft, I invited her because she is a good friend and a great poet. It helps if you know other people before you ask them. I have some more guest posts coming up, from poets, bloggers and writers who I admire. Ask around and spread the love, that’s what I am doing. Reblogged this on PUQUIN WORLD.